Penelope the pit bull has a brand-new home. She found her forever family on New Year’s Day and the experience was a far cry from where her story (the part we know about, anyway) began. 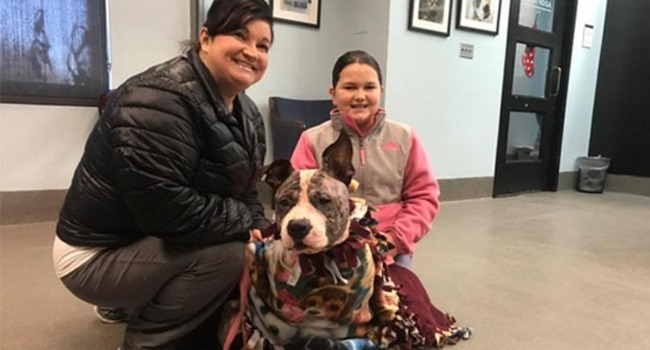 Vets for Richmond Animal Care and Control treated her for hypothermia, preventing its onset, and cleaned up multiple bite wounds they suspect she suffered as a result of being part of a dog-fighting operation. She had a fracture and holes in her sinus cavity, as well. RACC believes Penelope to be three or four years old. Her case is now an open investigation. Good news, according to RACC: 2017 marked the first year there was enough funding in their foundation for every life-saving surgery necessary for the animals in their care. In 2016, they were only able to help 68 percent of their charges. “We see animals that are injured, neglected, animals hit by a car, thanks to this foundation we were able to cover the emergency care of any animal in need in the city,” said Robin Young, RACC outreach coordinator. They also funded over 1,300 hours of on-site behavioral training and assessment services, to help make sure that each of the dogs and cats in RACC’s care found the right home. RACC, of course, will still need plenty of funding to continue helping in 2018.